Essex cricket players Danish Kaneria and Mervyn Westfield have been arrested following an investigation into betting irregularities. An Essex Police spokesman said the men had been arrested on Friday, but released on bail. 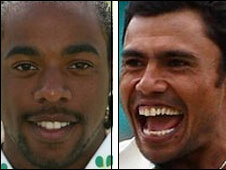 The allegations relate to spot-fixing, a practice in which money is placed on individual details of a match. It is believed that the match in question was a Pro40 win against Durham in September 2009. Essex Cricket Club confirmed that the arrested men were Pakistan leg-spinner Kaneria, 29, and 22-year-old pace bowler Westfield. An Essex Police spokesman said: "Two men from Chelmsford have been arrested in connection with a police investigation into first class domestic cricket match irregularities. "The investigation began in March 2010 following allegations received about two Essex county cricket players. "On Friday 14 May, two men aged 22 and 29 were arrested on suspicion of conspiracy to commit fraud and both were released on police bail until Wednesday 15 September pending further inquiries." Both men will be able to continue playing cricket until 15 September, meaning Kaneria will be available for Pakistan's Test series against England. Kaneria has competed in more than 50 Test series for Pakistan during his career.